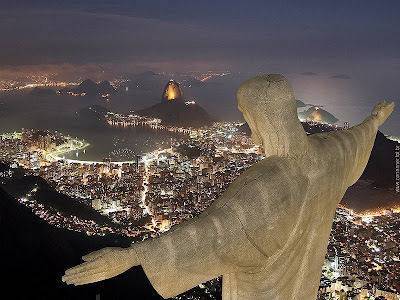 For the first time, the world's largest Catholic country will host the Olympics -- Rio de Janiero has just been chosen as site of the 2016 Summer Games. By an unknown margin as of this writing, Rio bested Madrid, Tokyo and Chicago in today's ballot of International Olympic Committee delegates at the body's meeting in Copenhagen. Already tapped to host the 2014 World Cup and the bookies' favorite going into today's vote, Brazil's win to hold the Games of the 31st Olympiad signifies the first time the event will be held in South America, home to nearly half the global church's billion-plus members. SVILUPPO: With the Windy City bumped on the first ballot after getting only 18 votes, Rio won 66-32 in a head-to-head with Madrid. While we're at it, it's worth noting that the Spanish capital has another Olympic-grade event already on its hands -- after a concerted bid, last year Madrid was chosen to host the next full-scale World Youth Day in August 2011, for which it's already begun to pull out all the stops. Respect Life... at All Its "Borders"